Terry has been a Maine fisherman for over 40 years. After fishing with his father as a youngster, he became a full-time deckhand onboard a trawler at age 16 and was hired as a fishing boat captain at 22. Terry purchased his own boat in 1990 and later had the 62-foot trawler Jocka built to his specifications. The Jocka fishes for groundfish in the winter in the Gulf of Maine and Georges Bank, and in the summer it fishes for squid from Nantucket to waters south of New York. Terry also owns the Rachel T that has the ability to use trawl gear to harvest northern shrimp. The Rachel T gillnets for groundfish in the late summer and winter and it fishes for monkfish in waters off Rhode Island and New York in the spring and early summer. Terry has engaged in a significant amount of cooperative research on both the Rachel T and the Jocka, from Nordmore grate work in the northern shrimp fishery to the industry-based cod survey for the State of Massachusetts in the Gulf of Maine. Katie is the Fishery Policy Analyst for the Town Dock located in Point Judith, Rhode Island. The Town Dock is the largest supplier of calamari in the United States. They own seven otter trawl vessels that fish for longfin squid, illex squid, whiting, butterfish, fluke, scup, black sea bass, herring, and a mix of groundfish. Katie is responsible for following all state and federal regulations that pertain to the species on which the Town Dock relies. She also sits on the following Advisory Panels: Squid/Mackerel/Butterfish, Fluke/Scup/Black Sea Bass, River Herring/Shad, and Small Mesh Multispecies, as well as the New Bedford working group for Wind Industry Issues and the Rhode Island Industry Advisory Committee. David retired from the Rhode Island Department of Environmental Management in 2004. He is currently the Executive Director of the Atlantic Offshore Lobstermen’s Association. In that capacity David formulates policy in regards to federal and interstate lobster management, habitat, whale entanglement, and NMFS regulations. David was Rhode Island Governor Raimondo’s appointee to the Atlantic States Marine Fisheries Commission (2013-2016). He represented Rhode Island on 18 species management boards and committees and chaired the Lobster, Jonah crab and dogfish boards. Bill is a commercial fisherman who owns runs Hooked-Up Seafood in Wildwood, the southernmost barrier island of the Jersey Shore, located between Atlantic City and Cape May. Beth is actively involved with the Bureau of Ocean and Energy Management over the past 8 years through many meetings and on the Fisheries Advisory Committee as well as the Habitat Advisory Committee ultimately leading up to her appointment to the Massachusetts Ocean Advisory Commission many years ago. Her approach and perceptive nature make her a valuable asset to both the commercial fishing industry and the Ocean Planning process. Beth’s past professional experiences range from sales, customer service and law enforcement and she utilizes all of these experiences to better serve the commercial fisherman. Beth grew up in a large fishing area within her town and has commercial fishermen in her family so; her personal experiences give her the heart and drive to keep moving forward with purpose and determination to better represent the commercial fisherman. Tom is the founder of Overboard Solutions, a safety management platform for the commercial fishing industry scheduled for launch in 2019. 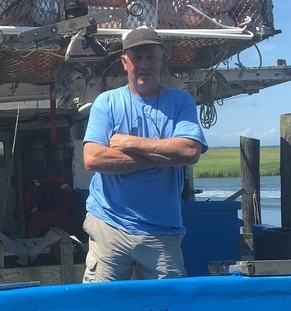 He has been involved in the Atlantic surfclam/ocean quahog industries since starting as a deckhand in 1983 with the American Original Corporation and working his way up to captain. After earning his USCG 1600-ton Master’s License and fishing a couple of catcher/processor vessels in the Bering Sea, Tom became interested in safety management within the fishing industry and is a long-time USCG Commercial Fishery Safety Advisory Committee member. Since 2009, after 29 years at sea, Tom has helped manage the Surfside Foods fleet of clam vessels and more recently became a Surfclam and Ocean Quahog Advisory Panel member. Tom was involved in the establishment of the New Bedford’s Fishermen Safety Training Program; was project manager for the major modification of the F/V Christi-Caroline; and has contributed in stock assessment gear design at the federal and state levels. Tom’s current projects include final development of the safety management platform, the protection of essential fish habitat, and ensuring the responsible development of offshore energy and aquaculture resources. Greg is the Executive Director of the Garden State Seafood Association (GSSA). In this role, he attends Mid-Atlantic Fishery Management Council and Atlantic States Marine Fisheries Commission meetings in order to evaluate changes to the Fishery Management Plans under the authority of these regulatory bodies. He is responsible for submitting written comments and giving public testimony on behalf of GSSA’s New Jersey seafood industry members. He represents the association to the New Jersey State Delegation as well as to U.S. Federal Delegations. This requires frequent communication and the development of a sound working relationship with legislative staff. In addition he tracks state and federal legislation and follow the actions of relevant committees. His experience within the management process, combined with his understanding of the everyday operations of many fisheries, has given him a thorough understanding of all aspects of fisheries management. Eric is the owner of the scallop vessel F/V Endeavor based out of New Bedford, MA. He has a total of 40 years of experience in the scallop industry, starting as a deckhand in 1978 and working his way up to captain and then owner. He served as a scallop vessel captain for 28 years. Eric is a Board member of the Fisheries Survival Fund and a member of the New England Fishery Management Council’s Scallop and Monkfish Advisory Panels. He is also a Massachusetts Fisheries Institute (MFI) Industry Advisor, and member of the University of Massachusetts’ School for Marine Science and Technology’s Fishermen's Steering Committee, the MA Fisherman's Working Group on Offshore Wind Energy, and the New Bedford Port Authority’s Working Group on Offshore Wind Development. Dewey is the owner/operator of the 42-foot F/V Tarbaby with his homeport in Wanchese, NC. He has been commercial fishing for 24 years off the East Coast, ranging from New York to Florida and has a wide range of fisheries experience. He has served on advisory panels for Highly Migratory Species (National Marine Fisheries Service), Dolphin-Wahoo (South Atlantic Fishery Management Council) and as chairman of the N.C. Spiny Dogfish Compliance Advisory Panel. Dewey holds permits and fishes for tuna, swordfish, dolphin-wahoo, bluefish, spiny dogfish, smooth dogfish, croakers, blueline tilefish, golden tilefish and large coastal sharks. He has also been active in an outreach program for K- 12 students across the country for the past seven years through Provider Pals. His presentation showcases an array of photos from his years on the water, and summarizes a day in the life of a commercial fisherman, encouraging students to consider the logistics and challenges that are involved with operating a fishing vessel for a living. Dewey has recently expanded his outreach program by partnering with the N.C. Coastal Federation, sharing his lesson with over 400 middle school students living on the coast of North Carolina. Located in Cape May, New Jersey, Peter is the Director of Sustainability for Atlantic Capes Fisheries, Inc. After commercial fishing for squid and mackerel on the East Coast, Peter started working for Atlantic Capes Fisheries in 1990. Peter is currently a voting member of the Mid-Atlantic Fishery Management Council and the liaison to the New England Fishery Management Council, helping them facilitate policy and the responsible stewardship of our nation’s oceans. Peter is also a Board member of the Science Center for Marine Fisheries (SCeMFiS), a National Science Foundation recognized Science Center. “Maintaining the sustainability of our living marine resources through the use of the best available science is an essential goal and one I will continue to strive to achieve.” Peter and his wife Gwen are raising two children in Stone Harbor, NJ where they have lived for over 30 years. Ben Landry is director of public affairs for Omega Protein, a menhaden fishing company with operations in the Atlantic and Gulf of Mexico. Meghan is the fisheries liaison for Seafreeze Ltd., the largest producer and trader of sea-frozen seafood on the U.S. East Coast. Seafreeze operates two freezer trawlers out of North Kingstown, RI, that harvest species such as squid, mackerel, butterfish and herring. Meghan is a member of the New England Fishery Management Council’s Herring and Habitat Advisory Panels, a member of the Mid Atlantic Fishery Management Council’s Mackerel, Squid, Butterfish Advisory Panel and Ecosystems and Ocean Planning Advisory Panel, and a member of the Atlantic States Marine Fisheries Commission’s Menhaden Advisory Panel. As an active member of the fishing community in all fisheries in the Mid-Atlantic and New England for over 40 years, Eric has developed extensive knowledge of both fishing operations and shoreside infrastructure. He has personal experience both on board fishing vessels and managing shoreside operations from New Jersey to Maine. Eric is currently serving his second term as a New England Fishery Management Council member from Rhode Island, serves as the liaison to the Mid-Atlantic Fishery Management Council, and is also a commissioner to the Atlantic States Marine Fisheries Commission (legislative proxy) and the commercial fisheries commissioner to the Northwest Atlantic Fisheries Organization. Eric is currently employed by Seafreeze Shoreside, Inc. a large wholesaler/processor of a wide variety of seafood located in Narragansett, RI. Mary Beth represented the State of Maine as an at-large member of the New England Fishery Management Council from 2008-2017. She is currently the government relations representative for the O’Hara Corporation of Rockland, ME, a family-owned company with diverse fisheries interest from the North Atlantic to the Bering Sea. Mary Beth also is the former executive director of the East Coast Pelagic Association. Additionally, she is a principal in the Marine Resources Education Project, a federally-funded fisheries education and outreach effort organized in partnership with the Gulf of Maine Research Institute. The project provides fishermen with the necessary tools to understand and participate in the region’s scientific and management processes. She serves as an industry advisor to the Gulf of Maine Research Institute and the Atlantic States Marine Fisheries Commission.